It was Saturday again, which gave David and I another chance to head to the San Rafael Swell for another day of hiking and exploring. 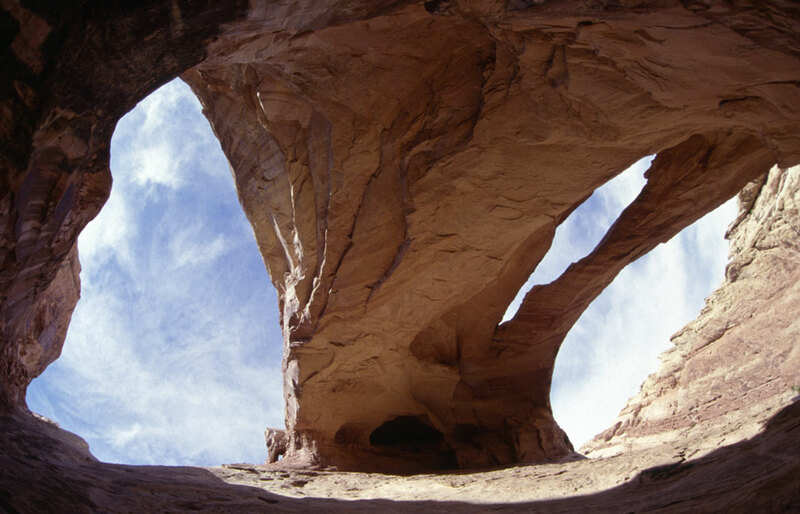 We wanted to try, for the third time, to climb up to Camelhead Arch and Mystery Double Arch in the San Rafael Swell. We had tried several weeks earlier but were turned back by several tricky spots. We were going to try our original path again, but this time with ropes. We parked on the east side of the San Rafael Swell, south of the I-70 freeway, at the mouth of Uneva Canyon. We then hiked for about a third of a mile up the canyon, to the base of a boulder strewn ramp that allowed us to climb up the north slope. That was rough climbing. Finally we were at the top of the ramp which allowed access to a drainage that dropped to the east. This was the drainage that stopped us before when dry falls were more than we could climb down. Using short ropes, we were able to drop over the steep parts. There was even one stop that required belly crawling under a large boulder. Mystery Double Arch is awesome! It’s gigantic! Easily a class ‘A’ arch. However it is really hard to photograph since you can’t back up far enough to get everything in. 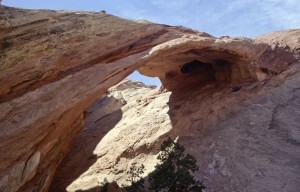 I then decided to try for Camelhead Arch while David waited at Mystery Double Arch. This required some more tricky climbing including some over the head “stemming” using a low cliff shelf to push against, to get enough traction to climb the steep rock slope. 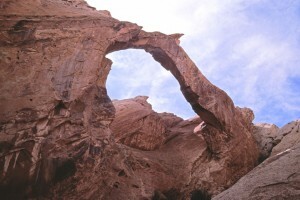 I finally reached a “hanging garden” area and was then able to make my way northward over a few fins to Camelhead Arch. By then, the light was lousy for taking pictures. I then headed back down the steep slope. David and I then made our way back up the drainage and down the boulder ramp. By the time I hit the bottom of Uneva Canyon, all I could do was collapse on a flat rock. We drug ourselves back to the vehicle absolutely exhausted.